Bundle up for an outdoorsy adventure with the entire family. With the cold weather upon us, any outdoor activities might seem like an impossible feat. But when the mercury hasn't dipped too low, you and the kids can work off some stir-craziness and winter blues with an outdoor exploration. Long Island is home to several parks, preserves and historic grounds that provide hiking trails, serene nature and breathtaking views--even in the middle of winter. So grab your warmest coats and boots and head for the hills (so to speak). And don't forget to check out our calendar for more Long Island activities to get you through the winter months. This 11-acre Nassau County park and preserve has a mostly flat trail that meanders through the woods and around a pond. The pond has been restocked and fishing is allowed here. Leading down to the trail is a rolling green that kids will enjoy finding their way down! 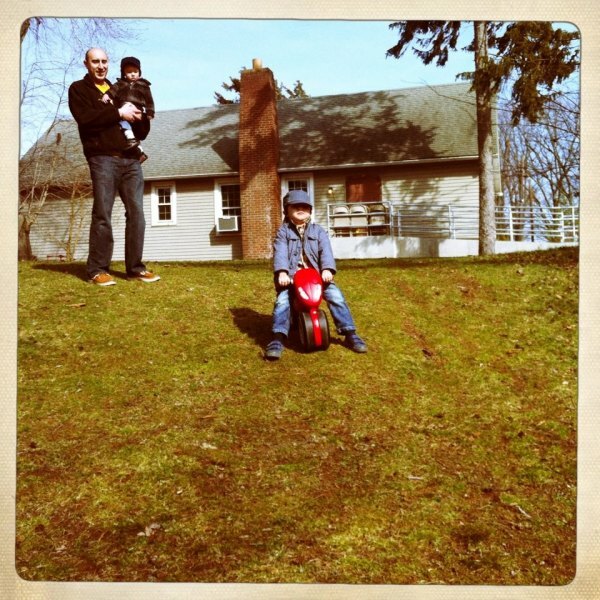 We brought a ride-on toy for the occasion. The Center for Science Teaching & Learning is also on site, where kids can enjoy an indoors live animal exhibit. The trail is free, however admission is $6 per person to CSTL. 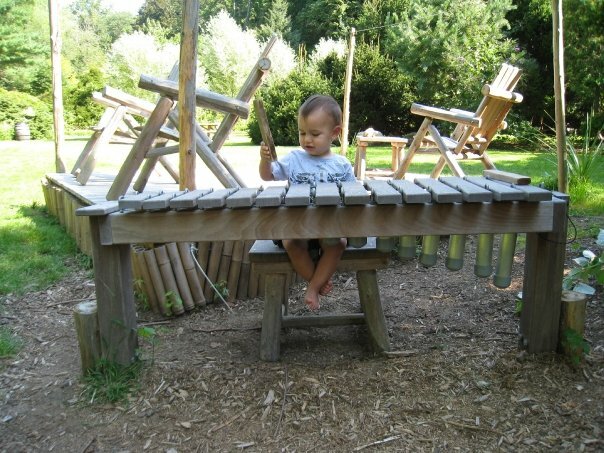 This 40-acre North Shore preserve in the Children's Habitat allows kids to explore, climb, build and create and even make music. Picnicking, dog-walking and cross-country skiing are allowed here. 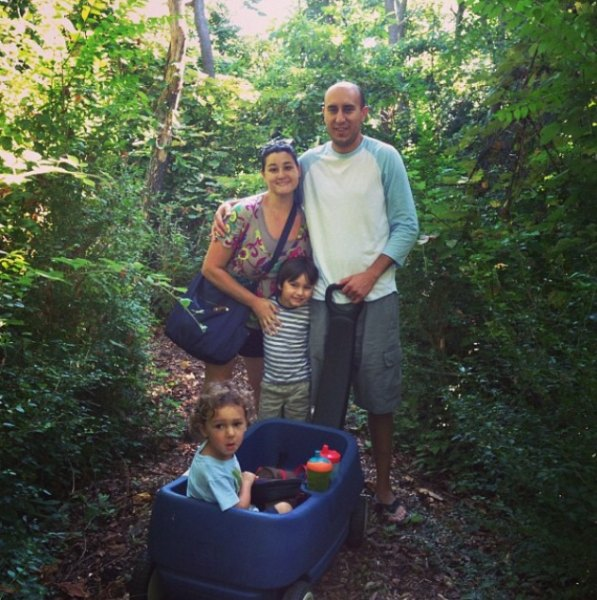 Family Nature Adventures are held on Sundays at 2pm. There is no charge, however, donations are encouraged. Photo opp: There's an oversized rocking chair that's the perfect prop for an impromptu photo session. Open year-round 9am to 4pm. The possibilities are endless at this lush, forested 627-acre park that is open year-round to Suffolk residents (and their guests). The head of the Nissequogue River is also located in the park. Hiking, fishing, camping, row boats, horse paths, a playground and dog run are all available here. A trust featuring historic buildings dating back to the 1700s are also located on the property. 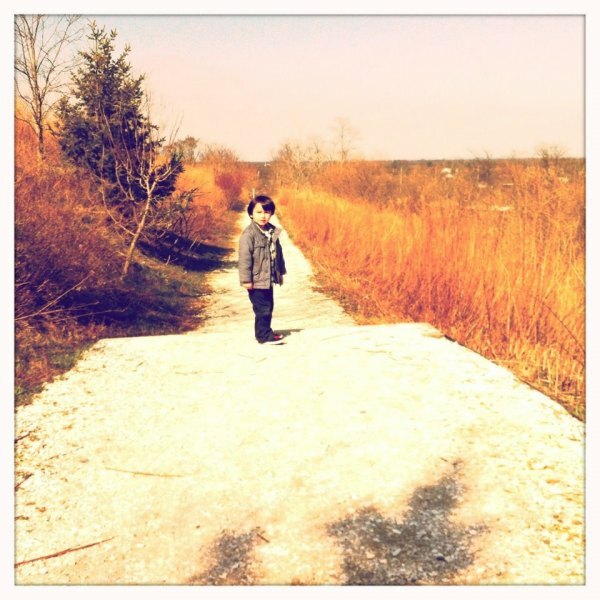 Hikes are led at 1pm on Saturdays here by the Long Island Greenbelt Trail Conference. Note: The Jericho Turnpike entrance has more rugged trails. This 691-acre park overlooking the Connetquot River is described as an "oasis of beauty and quiet." When you walk along the trail, trees types are labeled for education purposes. Sorry, no pets are allowed. In the winter, Bayard offers a family fun flashlight hike. Hikes are $4 for adults, $3 for children ages 3-17. Kids under age 3 are free. While the lighthouse itself is only open from Memorial Day to Columbus Day, the grounds are open and provide an eight-acre preserve with wooded nature trails and spectacular water views. Descend 120 steps down to the rocky beach. The center also boasts an indoor, interactive museum experience. The panoramic deck offers a 180-degree view of 70 preserved acres of scenic fields and woodlands. The Vineyard Nature Trail meets up with a nine-mile trail system know as the Long Pond Greenbelt. This stretches from Sag Harbor to the Atlantic Ocean. Animal feeding times, seal walks and beach hikes are just some of the activities available for children at this nature center. Open 10am to 4pm, year-round. Admission for adults is $7, $5 for children ages 3-12. Kids under 3 are free. Nature trails and sweeping water views are abundant at this state park. Cross country skiing and dog walking is also permitted. Other activities on site: You can visit the state's oldest lighthouse, the Montauk Point Lighthouse. Enjoy a Seal Walk on the eastern-most tip of the South Shore of Long Island. This three-mile hike will take approximately 2-3 hours. Fee is $4 per adult, $4 for kids ages 3-18 and kids under 3 are free. Reservations required. There is also an $8 parking fee.